Prosecutors have alleged Tim Lambesis handed $1,000 (£650) to an undercover police officer posing as a hitman. 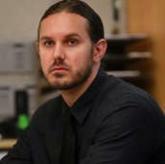 Mr Lambesis, 32, has pleaded not guilty to solicitation for murder. He has been on $2m (£1.25m) bail since May and wears a GPS tag. These conditions will remain until he appears in court on 22 October. He was also ordered to stay away from his estranged wife, Meggan Lambesis, and their three children. The singer of the Grammy award-winning band will stand trial in San Diego County superior court in Vista, California, and faces up to nine years in prison if convicted. At a preliminary hearing in San Diego on Monday, several hours of testimony were heard by witnesses for the prosecution including that of the undercover officer whom Mr Lambesis allegedly paid to kill his wife. San Diego County sheriff's officer Howard Bradley was sent to meet Mr Lambesis at a book shop in San Diego on 7 May after his team received a report that the singer had asked a personal trainer at his gym to help him get rid of his wife. Officer Bradley told the court he asked Mr Lambesis directly if he wanted his wife to be killed and the singer replied, "Yes". Mr Lambesis was then arrested at the shop. Defence lawyer Thomas Warwick did not present any arguments during the hearing. Mr Lambesis's wife filed for divorce last September. The couple adopted three children from Ethiopia before separating. As I Lay Dying, who formed in San Diego in 2000, have sold more than a million albums. Last year, the band - who take their name from a 1930 novel by William Faulkner - released their sixth album, Awakened. Nothing Left, a single from their album An Ocean Between Us, was nominated for a Grammy for top metal performance. In a message posted on the band's website earlier this month, Mr Lambesis's bandmates said they would call off a forthcoming tour. "Given the circumstances, we feel that it is best for the band to be off the road while the current situation gets sorted," they said. "We'd like to thank all of our fans for their ongoing support at this difficult time.